The Clyde waterfront project has been in the works for a long time, but as of November 2018 one of the most significant steps forward was made, when the project was approved by Scottish government ministers. The project will primarily benefit the communities of Renfrew and Yoker, located on either side of the Clyde river around five miles west of central Glasgow. Known formally as the Clyde Waterfront and Renfrew Riverside Project, it’s hoped that the development will create over 2,300 jobs and add £867 million to the local economy. If it can attain those numbers, the project will be one of the top performers in the Glasgow City Region City Deal, which aims to support the city and surrounding regions via infrastructure improvements worth over £1 billion. Other Region City Deal projects in the Renfrewshire area include the Glasgow Airport Investment Area, which aims to develop a large manufacturing district adjacent to the airport, and the Airport Access Project, which will link Glasgow Airport and Glasgow Central Station via rail. The Clyde waterfront project is expected to start at the end of 2019, with completion in 2022. Public support for the project has remained strong over the past few years, with 90% of respondents in favour. To redevelop the waterfront as an attractive, usable, and sustainable urban area by improving access, and by adding housing, business, and employment opportunities. To improve access for outlying communities to key sites alongside and across the Clyde. To enhance the local environment with high quality sustainable landscaping. To improve the local road network by optimising reliability, safety, and transit time. To improve local green spaces and make those spaces more accessible. The defining feature of the Clyde waterfront project is a new bridge that will link Renfrew and Yoker, improving accessibility for communities on both sides of the river. The bridge is planned as a “twin leaf” opening road bridge, which will allow for the passage of both river and road traffic. The twin leaf design uses a modern cable suspension system, and features distinctive vertical masts on each side of the river. 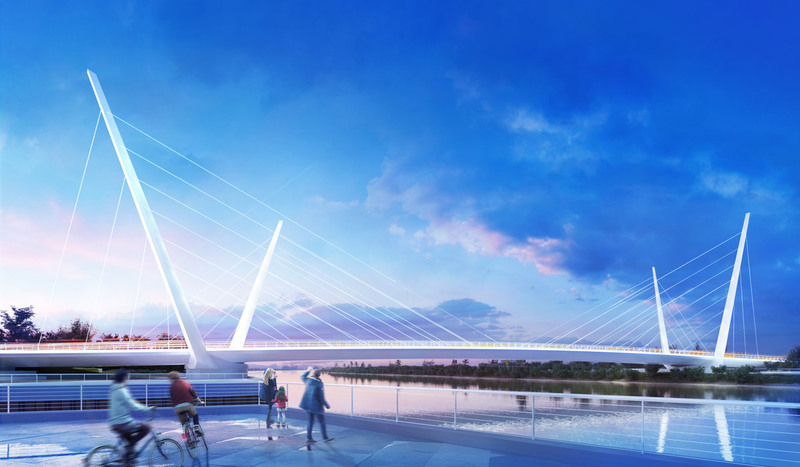 The design is intended to celebrate the local area’s ship-building heritage, with the turning of the masts as the bridge opens resembling the motion of riverside cranes. The bridge was designed by the Kettle Collective, in collaboration with engineering consultants Sweco. Headed by award-winning architect Tony Kettle, the Kettle Collective typically focuses on designs that try to avoid making big changes to the local landscape, and instead opt to enhance and complement it. Founded in 2012 by Tony Kettle and Colin Bone, the Kettle Collective has earned a number of awards in just a few short years, including the 2015 ARCHICAD Project of the Year, for its work on The Ripple Retreat. It’s also the firm behind the Lakhta Centre, completed in 2018, which features a unique and wholly spectacular five-sided twisting design inspired by the local St. Petersburg history and landscape. ARCHICAD and BIM tend to play important roles in Kettle Collective projects, and it’s likely that the Clyde bridge project, with its own unique and spectacular design, is no different. The new bridge is expected to have a big impact on communities on both sides of the Clyde, improving accessibility of schools, hospitals, employment, and more for everyone in the area. The bridge will accommodate multiple modes of transport, with walkways and cycle lanes in addition to roads. 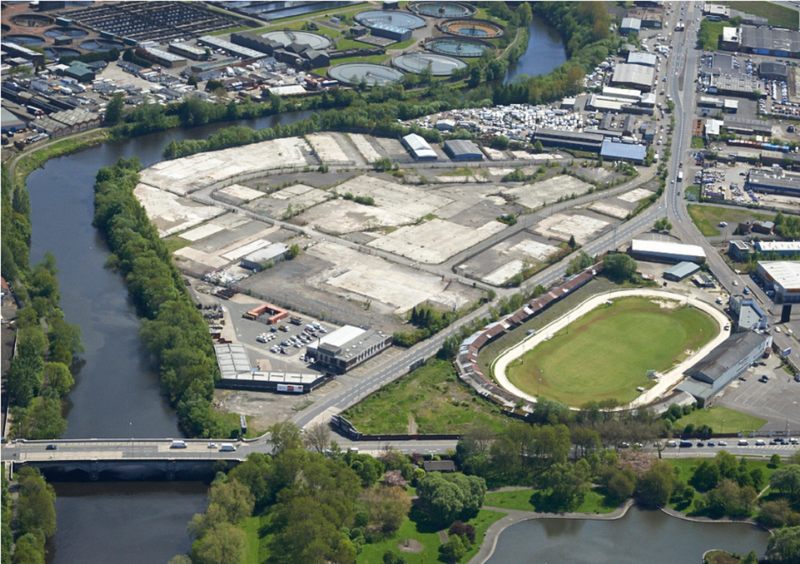 New networks of roads, walkways, and cycle lanes are also being added to ease local congestion and improve the accessibility of the new manufacturing district being developed adjacent to the Glasgow Airport. The 150-acre site is already home to two national innovation centres, and with improved accessibility should be in a good position to attract new industrial residents. Now that planning consent has been given, the next step for the project is tendering for the construction contract. With site work scheduled to start by the end of 2019, it’s expected that this phase will be completed relatively quickly. ← Why not have a fixed term ARCHICAD licence?